A new treatment for allergies is gaining popularity. Sublingual immunotherapy works to tame the immune response, much like allergy shots. 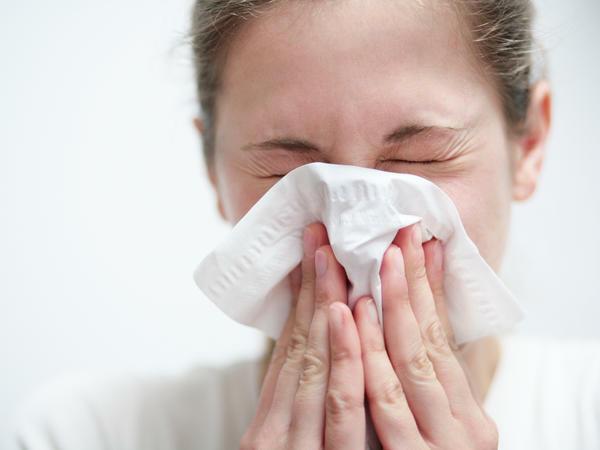 If allergies have you sneezing your way through spring, you are not alone. Allergy shots are one treatment option, but many allergists are now prescribing some of their patients tablets that can be taken at home. NPR's Allison Aubrey reports. ALLISON AUBREY, BYLINE: When I was a kid, I remember weekly treks to the doctor to get my allergy shot, and thanks to my mom, who made all those trips, the strategy seemed to work. As an adult, I don't have symptoms, and that's because the shots can actually shift or alter your immune system. They're a form of immunotherapy, and the newer tablets, which were approved about five years ago, work in the very same way. Allergist Mike Tankersley who practices in Memphis, Tenn., says that tablets are easy to take. MIKE TANKERSLEY: It's a little wafer tablet that you put under your tongue. It dissolves in about 10 seconds. AUBREY: Now, unlike allergy shots, which can be formulated to treat a whole bunch of allergies with one shot, the tablets target just one allergy. So Tankersley says they're most effective for people who have one or two main allergies that bother them. There are four FDA-approved tablets on the market to treat grass pollens, dust mites and ragweed. TANKERSLEY: I've had several patients in my practice who had been very happy with having a product that they can take it home. So those patients who, historically, we didn't really have anything to offer them, is now we've got something to offer those patients. AUBREY: According to a new survey by the American College of Allergy, Asthma and Immunology, 73 percent of allergists now prescribed tablets to some of their patients. TANKERSLEY: There's been a significant change in practice in the United States. HAROLD NELSON: Where grass is way far the predominant allergen, then the grass tablets are great. AUBREY: Mike Tankersley, the allergist back in Memphis, says most of his patients take allergy shots because they have a lot of allergies, but about 1 in 10 do take the tablets. He says over-the-counter medications, like the nasal steroids and antihistamines, work too, but they offer just temporary relief of symptoms. The shots and tablets aim to fix the root cause. TANKERSLEY: And that's the big advantage of immunotherapy. We're really shooting for a cure. AUBREY: A way to end or reduce symptoms for the long term. Allison Aubrey, NPR News. Transcript provided by NPR, Copyright NPR.